Keeping up with your friends is important in high school. More than 80% of teens own a cellphone to help them communicate with their friends, family, and extracurricular activities. There are so many things pulling for your attention, but when you are behind the wheel, it’s important to focus. Teens are infamous for risky behaviors, but one of the most dangerous is texting and driving. People in general feel invincible, but it’s more common in teenagers. Texting and driving is something that most people feel like they are completely capable of doing with no problems. Statistics tell a different story though. Here are some of the most important statistics that can show you just how dangerous this is for drivers everywhere. In the United States, there are about 421,000 people injured every year in a car crash where distracted driving is a factor. More than half the collisions in the country (around 64%) involve a cellphone. It only takes about three seconds of taking your mind off the road to cause a crash. Some of the most common occurrences are slowing traffic, lane changes, and kids or animals running into the road. Looking at your phone for five seconds while traveling at freeway speeds equals traveling over 500 feet without looking. This is about the length of a football field. Even though 94% of teen drivers understand the consequences of texting and driving, more than a third admit that they still do it. One quarter of polled teenagers respond to at least one text behind the wheel, every time. 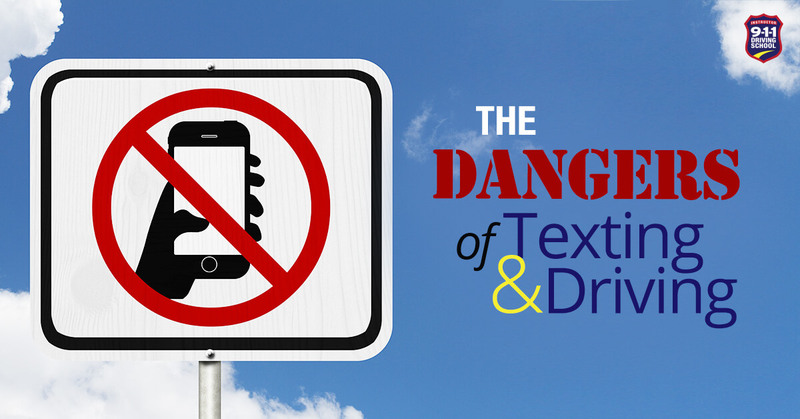 More than 1600 children die every year in car crashes involving texters. During texting, drivers leave their lane 10% of the time. Teen driving schools are all taking a focus on teaching better about texting and driving. Every day, there are 11 teenage drivers who die because of texting and driving. This is just the drivers, this doesn’t even account for pedestrians and passengers who are in the vehicles involved in these incidents. This is a big problem that is catching a lot of attention with teen driving schools and law enforcement across the nation. Campaigns are run from many organizations and schools, but the best way to stop texting and driving is for individuals to step up. But what can you do, as a teen driver, to help? Make yourself a promise. Decide that you are not going to text and drive, then stay true to that decision. Speak Up. If you are riding in a car, make sure you say something if the driver reaches for their phone- even if the driver is your parent. Not only can it save your life, it can save everyone else around you too. Come up with an alternative plan. Instead of responding to a text, hand it to a passenger to handle, pull off the road, or just wait until you get to your destination to respond. Knowing what you’ll do before it happens keeps you focused. Set an example. Whether it’s to the passengers in your car or the drivers around you, set an example by putting your phone away. Resist the urge to reach for it when a message comes in. These may seem like small things, but each of these small acts add up to make a big difference. Commit to keeping the roads safe by not texting and driving and you might just save a life, including your own.